Arlo is only just approaching his 20th birthday, but experience has already left him all too familiar with what he calls 'the black weeds' crawling about his troubled mind. His ability to hold things together depends to a critical degree on his continuing friendship with Luke – they’ve known each other since childhood. They share a flat in what seems to be London, though Ruffles chooses never to use the city’s name. They’re not a couple, but their relationship is unusually deep-rooted. The interplay of their minds and words is rare in its rich playfulness, each needing and celebrating the other. So when Luke is suddenly killed in an accident, Arlo is devastated, especially as he blames himself for the tragedy. The death comes as early as page 50, and for the rest of the book, Arlo is searching. It is so difficult for him to find meaning or purpose, to make connections – with his mum, with friends. His job – playing a character in a modestly successful TV soap – offers no satisfaction. At first, it’s difficult for him to make any connection with Mizuki either. Arlo has taken flight - to get as far away as he can from Luke’s death, the flat, the soap opera and 'Arlo’s Army', his followers on social media. He heads for the other side of the world and washes up in what seems to be Japan (again, Ruffles is not specific). When they meet, Mizuki is also travelling and, as Arlo slowly learns, she too is lost; since neither is ready to trust, each tells the other only a little of their truths. Their journeys together around the country are guided by Mizuki and her camera. She is, so she says, in search of a photograph for a competition she must win. For her subjects, she is fascinated by decay and decline – buildings and landscapes – abandoned hospitals, factories, a funfair. Day by day, Arlo is drawn further into her search. Sometimes, very little happens for several pages by way of plot-developing incident or the introduction of new characters; Ruffles might implicitly invite us to be absorbed by Mizuki’s composition of a single shot, or her preference for night-time images. At times, the novel almost becomes a travelogue of oriental wastelands. Readers will need to enjoy the careful, even self-conscious, crafting of the descriptive language; or the nuances within mundane conversations between the two which may, or may not, reflect slight shifts in their relationship. Luke, the son of the site owners. Here, in time, there is hope for Arlo and maybe Mizuki too. 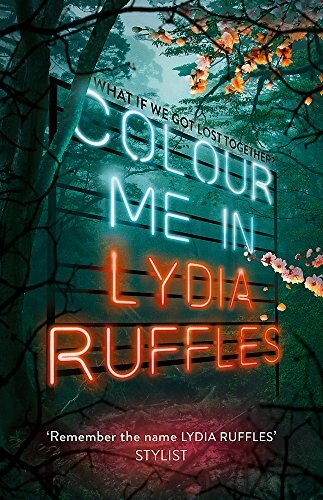 Colour Me In resists conventional YA classification; perhaps it is a literary – a poetic - case study of one, or maybe two, precariously poised young people who retain just about enough self-belief, capacity for loving friendship, artistic creativity, to keep trying to move forward. It’s one of those YA books where prior subjective reading preferences may shape response. One reader might be fascinated by Arlo’s mental and geographical journeys and the way they are told. Another’s reaction to those sections might be impatience. Novels with mental health at their heart do tend to divide readers.